So it was that with the unfailing support of my friends and family, I went out and purchased wood. Not just any wood, but solid oak boards from a local lumbar yard. Being me, and knowing my inability to keep numbers in their proper sequences in my head, I did the wood shopping with a spreadsheet. I had it prepped with formulae for the necessary relationships of the various components, so it could spit out how many boards I’d need and what lengths to cut them at. Rather than forcing the wood to conform to a pre-set clutch of dimensions, I opted to have my dimensions conform to the wood. Then the lumbar yard guy was just a touch impatient and starting making suggestions and I placed my order from numbers in my head based on numbers he’d just told me, not the ones in the spreadsheet. Pay attention, gentle reader, for this, really, was the one mistake I made in the whole process. Nearly everything else was just a consequence. There was just a touch of mayhem, trying to get the wood into my car. I didn’t think to measure my trunk or anything like that, and the plywood for the backing flat out wouldn’t fit, and the boards for the sides didn’t really make it, either. 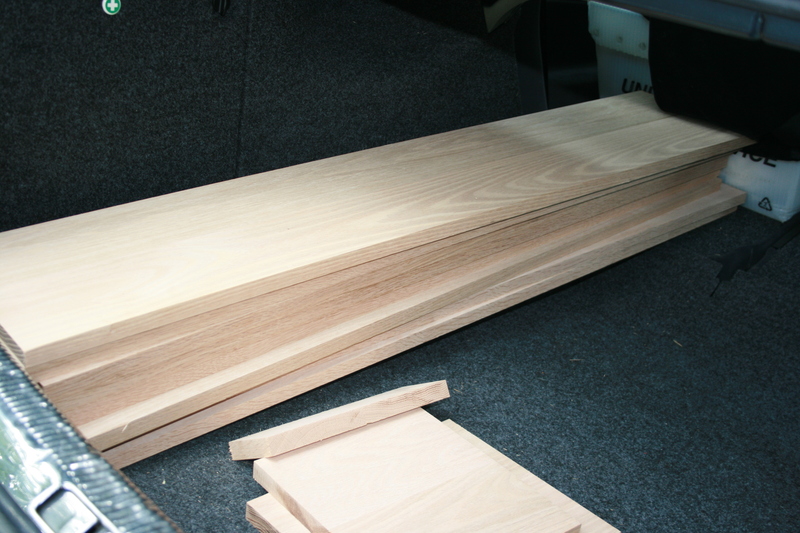 That’s a picture of the boards for the shelves in my trunk. As you can see, they’re about as long as the trunk can manage. In my defense, I’d only owned the car for a week at this point. On the other hand, the trunk wasn’t the only pertinent space I didn’t measure. 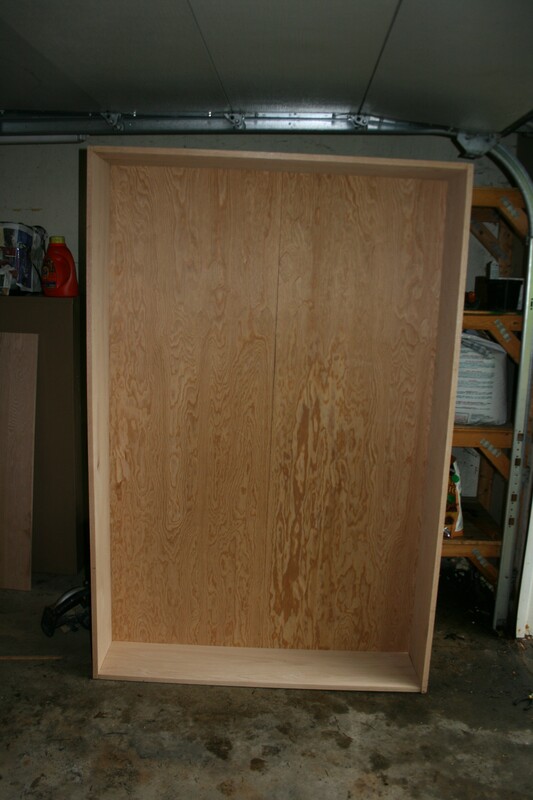 The boards started as 9ft boards, so I decided to build a 9ft bookcase. The ceiling in my den is, uhm, not 9ft high. Change of plans, 7ft bookshelf! 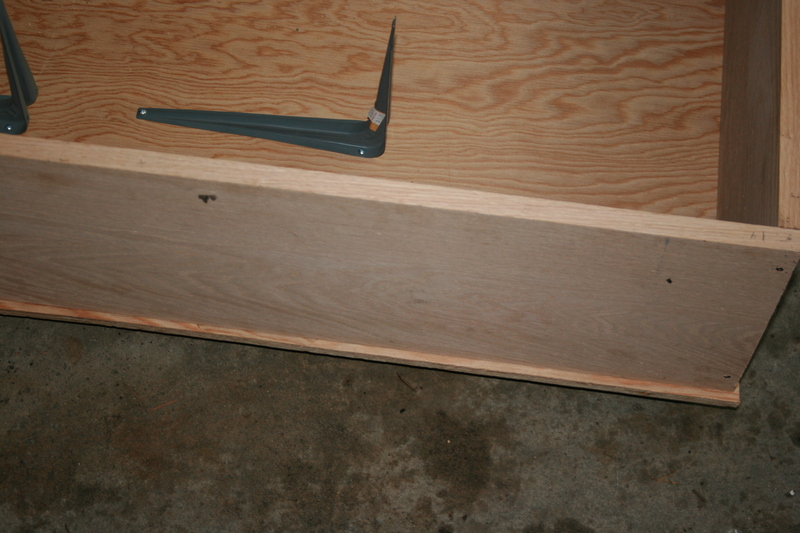 Since the plywood got sawed in half in order to fit into my trunk, I had to cut the top few feet off twice. That’s a picture of me making sure that my measuring on the second board matched my measuring on the first board. I was so very not going to screw up because I didn’t measure carefully enough. Also, T-square thingies are made of magic and why did nobody tell me about them before? They cause straight lines, even from me. After shortening all the necessary boards, I started tediously measuring carefully to pre-drill the holes in the various boards so they’d align just so when it came time to do the screwing. 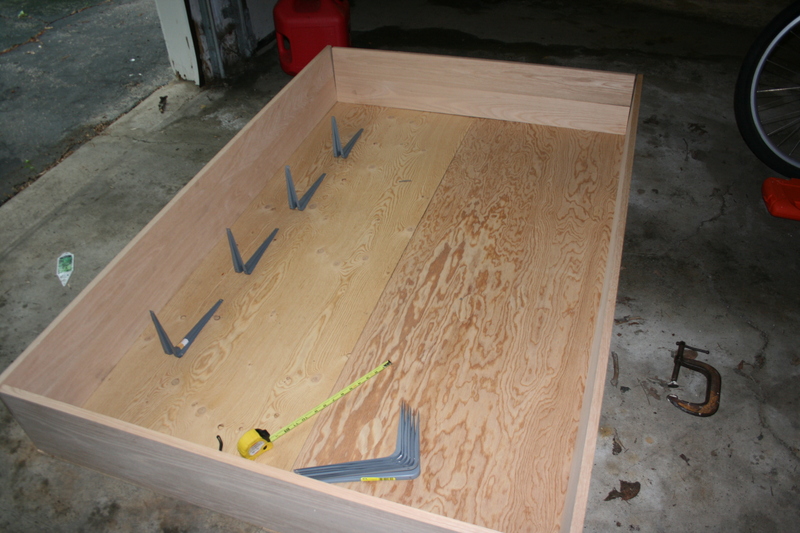 This is a step I’ll do differently next time – forget the measuring, line the boards up like I’m putting it together and do the drilling on the spot. Remember that mistake I made at the lumbar yard? I figured it out while I was doing the pre-drilling. You see, the boards for the top and bottom were supposed to be slightly longer than the shelf boards. I did not get two boards cut slightly longer; they were all shelf length. Another problem solved through application of circular saw. But how? I could totally figure that out in my head, and the result would be a lot of saw dust and the laughter of my friends. Oh no. I laid that sucker out. 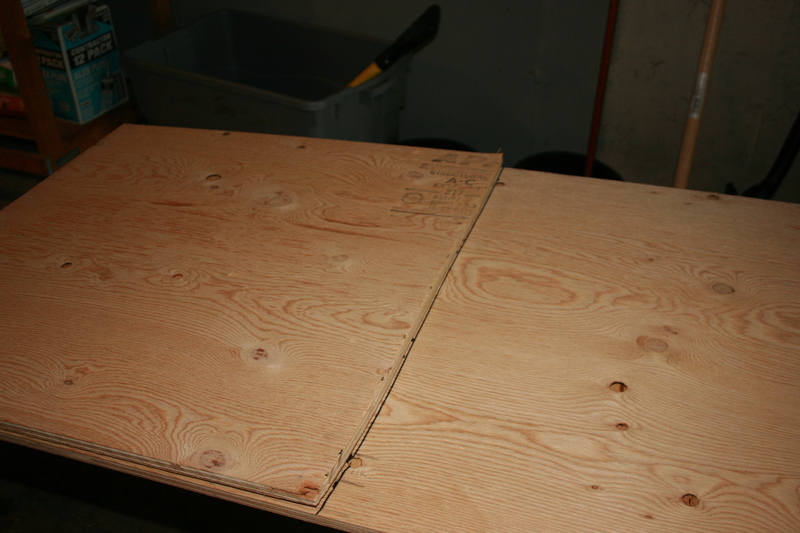 After carefully getting all of the boards to stand on their sides, I determined that the easiest way to fix the problem was to make the shelf slightly narrower and shorted than intended, screwing the top and bottom boards inside the outer boards instead of above and below them. That left me with just over an inch of extra width on the plywood I’d have to take care of. But trimming one piece of plywood gave me much less margin for screw up than trimming all five shelves, or so I thought. Apparently, plywood doesn’t like to have just a bit sawed off the long edge. It splintered a lot and the saw, which had done an excellent job of following my beautifully straight lines, was not so straight. I directed it outward, figuring it would be easier to get rid of extra material on the edge than to add some back in if I cut too much. After that, it was time to screw everything together. Which meant redoing most of the drilling, because all the careful visualizing and measuring in the world meant that none of my pencil marks lined up, none of my drill holes lined up, and, oh yeah, the drill bit I’d used was ever so slightly too small. Make all the libido jokes you want; by the time I was done, I was really tired of screwing. I had a bookshelf. And it stood up! I let it stand like that for fifteen minutes, just to make sure it wasn’t going to topple over. Then I did more screwing and installed the shelf brackets. I slid the shelves in and they fit! The only problem was the part of the plywood backing that was too wide. I went to town on that with a reciprocating saw and a sander. Did not get it smooth, but got it smooth enough. Then, because I was tired, and because none of the tools I used belonged to me and their owner was moving away the next day, and because all that was left was to varnish it and there was no rush, I put the shelf on its side and left it in my garage for two three months. Because summering in my garage during a hot, humid, Madison summer could never cause complications for unvarnished wood furniture. Tune in next time for the hilarious conclusion.